It’s seriously hands on for lesson 15. 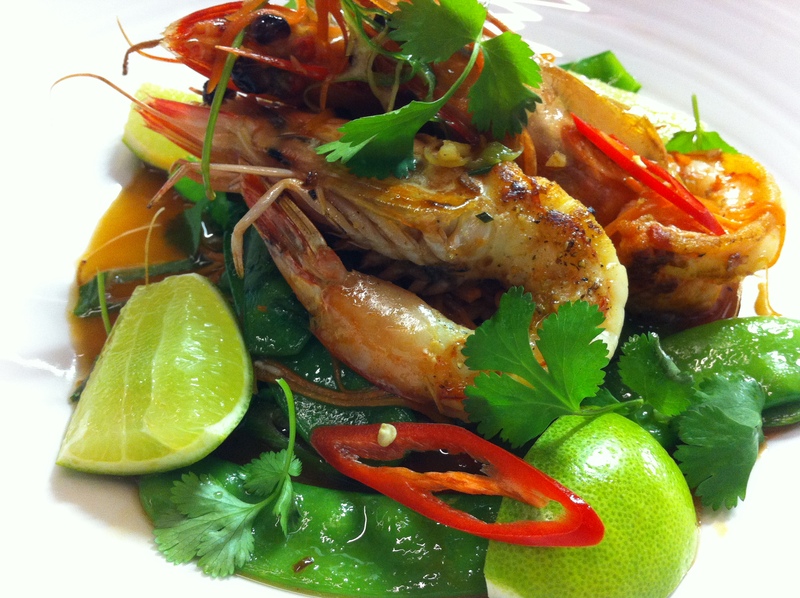 Fish and seafood dishes are all about preparation and last minute cooking. At the start of the practical we are presented with our ingredients. Some days are more daunting than others. 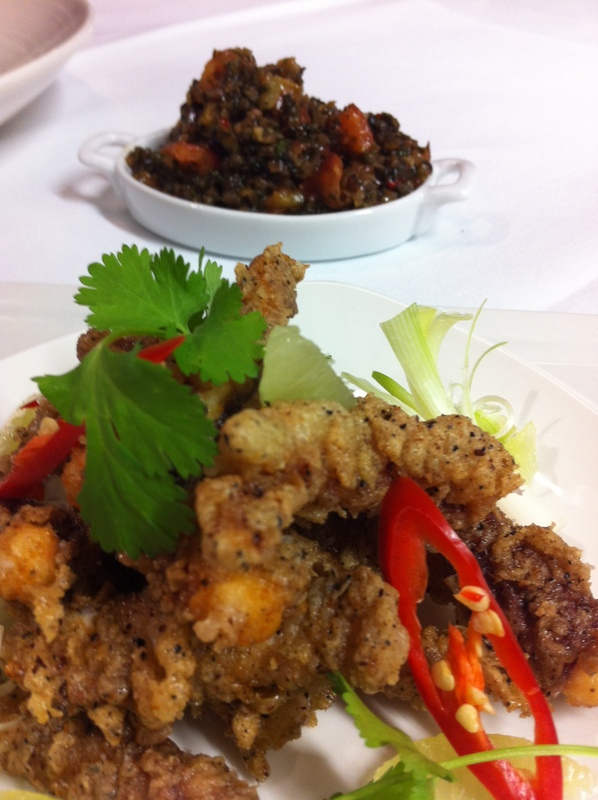 We are turning the whole baby squid into deep fried salt and pepper squid and serving it with an eggplant relish. The prawns, which have just been flown in, are going to be stir fried with vegetables. Pulling the squid apart is great fun but messy. 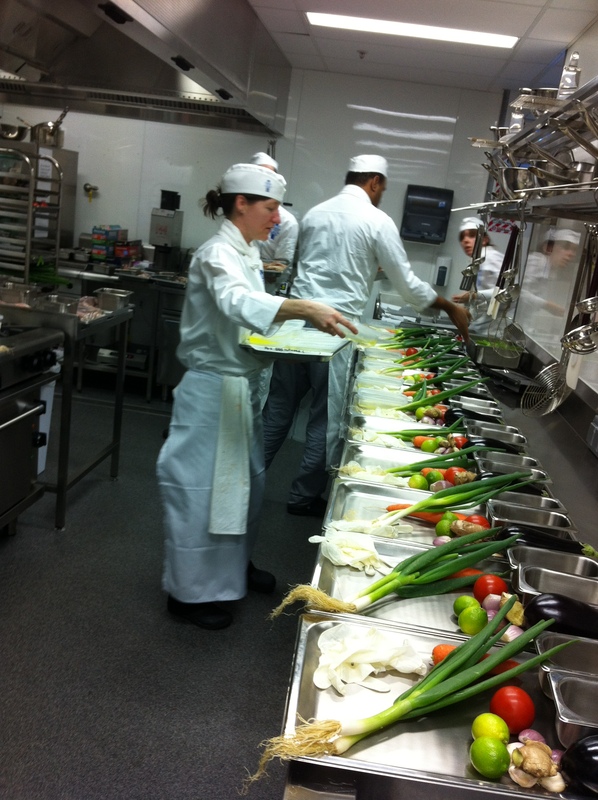 I love the process of preparing food from its raw fresh state even if it is time consuming. Once we have broken it down to thin strips and removed the plastic-like suckers off the tentacles, we coat it in lightly whipped egg white and a salty, spicy flour before deep frying. We toast the salt and spices first but need to take care as it burns easily. This dish comes with a warning – it is seriously salty. 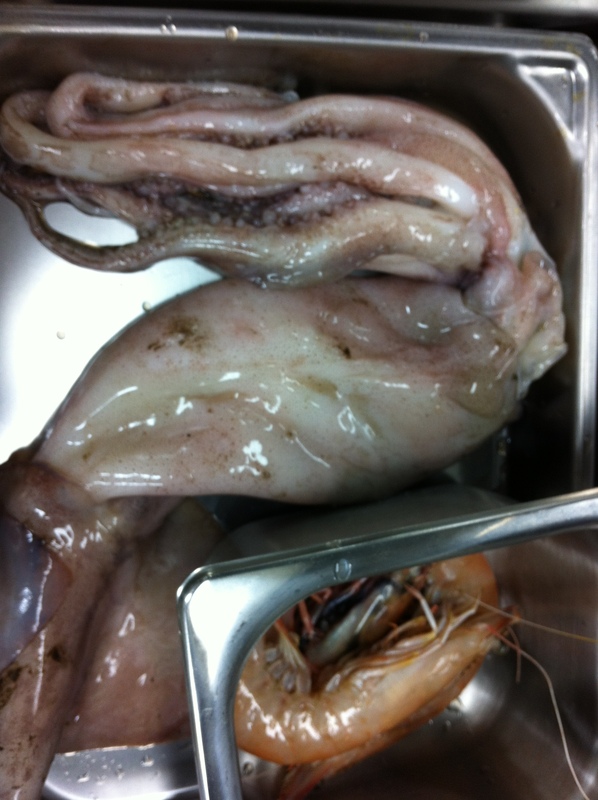 We’re cooking the prawns with heads and tails on but have to peel and devein them first. The big test is not to overcook them. We add finely julienne ginger, chopped garlic, snow peas and julienne carrots. We add the sauce at the last minute. It’s just chicken stock, oyster and soy sauce and sugar. So simple but it just brings the whole dish together. At the end of class Chef gives us a talking to about delivering on time and meeting the ten components that he is looking for: colour, consistency and texture, cooking, flavour, hygiene, presentation, temperature, workflow and kitchen management, safety and sustainability. It’s clear we’re moving up a notch. Isn’t it amazing that someone worked out that a rubbery, slippery squid could end up on a beautiful plate of food…thanks to experts like you. Delicious!! Squid always a firm favourite! !